HealthOffice® Anywhere Mental & Behavioral Health Case Management software contains the components every school district must have in order to be accurate, compliant, accountable, and fiscally sound. All of the features in the HealthOffice® Anywhere Mental & Behavioral Health Case Management software have been designed to provide professionals with fast, secure, and accurate documentation capabilities, allowing the district and the user to be compliant and accountable. Individualized Dashboards that allow the mental & behavioral health professional to have all the information they need right in front of them to perform their job quickly and accurately. New Individual Items contain documentation and encounter events specific to mental and behavioral health from the initial referral to the total clinical case review. Calendar scheduling tool displays calendars for the mental and behavioral health professional, the student, and the school. This calendar makes scheduling tasks and processes easier, quicker, and more accurate. Messaging capability that allows the mental and behavioral health professional to contact others regarding pertinent information. 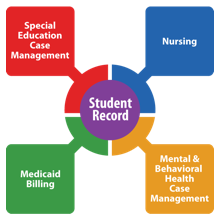 Case Management that allows the mental & behavioral health professional to capture and maintain all essential information regarding students with special needs while eliminating the duplication of student information, materially saving time for the user. Custom screens containing fields that reflect the information needed for district-specific forms. Complete Student Record containing all recorded information relating to an individual student in one place; information that is centrally located allowing for greater collaboration among school personnel. Task Management screen that allows mental & behavioral health users to account for and complete specific tasks related to a special education student&apos;s case in a timely manner. Navigation capabilities are made easy within the Student Search field and Student Summary screen. Mental & Behavioral Health Therapies that allow service providers to log therapy encounters quickly and easily and automatically record the necessary Medicaid billing information. Goals and Objectives can be customized to reflect school district standards and Common Core State Standards. Customizable Templates within the Task Management screen for creating a student case. Reports that capture student information easily and are readily available, enabling the mental and behavioral health user to meet deadlines and timelines associated with mental & behavioral health. Quick Events option that allows the mental & behavioral health user to navigate and readily access student information for logging therapies. Medicaid billing integration allows the quick and accurate recording of the specific ICD-9/10 codes, procedure codes, modifiers, and other billing-required information, generally done automatically by use of templates, as a part of documenting the student encounter. Request a demo today to learn more about the our Mental & Behavioral Health Case Management's features and benefits.